If you kill plants in soda bottle SIPs you probably shouldn’t even try to maintain a plant as a pet. You do need to take some responsibility. With a minimum amount of care, soda bottle SIPs are virtually foolproof. 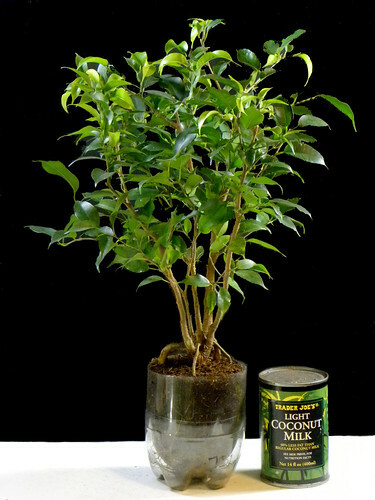 Houseplants as we know are living organisms that will die without food and water. Unlike animals, however, they have no way to go and get if for themselves. They need a human caretaker. Clear walls are one of the two major benefits of soda bottle SIPs. So, why are grow pots opaque? Opaque planters suit the greenhouse grower only, not the end user. They are opaque for one reason and one reason only and that is to prevent algae growth. That, however, is not a significant problem in low light interiors. Further, if you house the soda bottle SIP in a cachepot it isn’t a problem at all. The question is why would you not want to see the soil and root system. If the root system is not healthy and the soil moisture is unbalanced, you will surely have problems with the foliage part of the plant. Sick roots inevitably lead to sick plants and death. Let’s put one urban myth that I read regularly to bed right now. The roots of the plant will not be adversely affected by light. Grow a plant in a soda bottle SIP and see it for yourself. For the first time, you will see healthy roots growing right up to the wall of the planter. The equally important benefit of SIPs is sub-irrigation or capillary watering. Unfortunately, the ill-informed consumer market refers to sub-irrigation as “self-watering”. Planters that use capillary action are not “self-watering”. Unlike animals, plants do not have a brain that tells them to stop drinking. If you keep the reservoir full, you will inevitably drown the plant. A simple method of supplying water with SIPs is to always add a measured amount of water. Also, observe the soil moisture. You don’t ever need to poke your finger into the soil. Look at the soil and at the same time feel the weight. Since the planter weighs less than an ounce, you are getting a sense of the weight of the soil and moisture content. There is one cardinal rule. If you add so much water that it rises to the surface you added too much water. The top ½” to ¾” should always be dry. Do this and you will likely never have fungus gnats and will not over water your plants. Fungus gnat larvae require moist soil to live. Dry soil surface, no fungus gnats and no need for sticky traps, pesticides or diatomaceous earth. Don’t treat the symptoms; treat the cause that is soil that is too moist. Most people would not know that greenhouse growers use a scale to monitor soil moisture. They weigh sample plants to maintain control of their irrigation systems. If professional growers do this, why don’t you? Weighing a plant on a kitchen scale takes no time at all. Weigh the plant each time you water. Use a Sharpie pen to note the weight and the amount of water you added on the side of the planter. With this method, you provide the plant with a communication link, a simple form of biofeedback to tell you if you are giving it the ideal amount of water at each plant care interval. The feedback will be vital information about the light/water relationship the plant is living under. 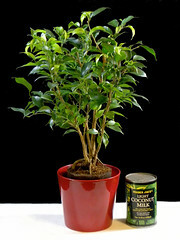 If you note that the plant is using a very small amount of water (you will know because you’re weighing it) there is likely insufficient light. If so, the plant will die no matter how careful you are with the water. 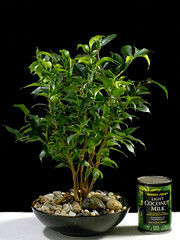 Add artificial light or move the plant to a location with more light. As you measure the amount of water, monitor the weight and observe the soil moisture with your own eyes, you will soon find the optimum amount of water to add each week (or two weeks). You will discover that plant watering isn’t rocket science and you do not need a mythological green thumb. Simple science will do.